Broadly, I am interested in ecology and themes pertaining to evolution, particularly life history evolution and biogeography. As a herpetologist, I am also interested in the biology of turtles, especially tortoises (Family Testudinidae). My research with turtles and tortoises has included analyses of population structure and status; home range, dispersal, habitat use, and seasonal activity patterns; reproduction and survival; population modeling; and biogeography. I’ve worked with a variety of species, including yellow mud turtles, gopher tortoises, and Agassiz’s desert tortoises. I am passionate about conservation issues, and much of my work has focused on analyses of threats to turtle and tortoise populations and making recommendations for management of habitat and conservation of populations. I am currently seeking funding for my planned post-doc study, a range-wide analysis of the genetic structure and biogeography of the east African pancake tortoise. 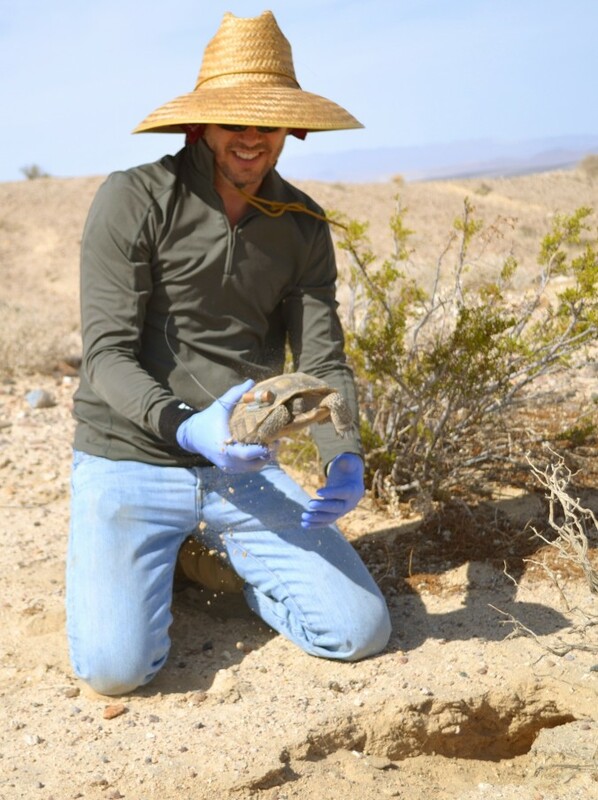 Michael Tuma with Agassiz’s desert tortoise at the Fort Irwin Study Site. Photo by Heather Huerta-Parks.